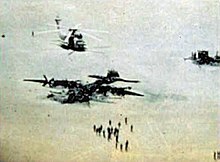 Operation Eagle Claw, known as Operation Tabas (Persian: عملیات طبس‎) in Iran, was a United States Armed Forces operation ordered by U.S. President Jimmy Carter to attempt to end the Iran hostage crisis by rescuing 52 embassy staff held captive at the Embassy of the United States, Tehran on 24 April 1980. Its failure, and the humiliating public debacle that ensued, damaged U.S. prestige worldwide. Carter blamed his loss in the 1980 U.S. presidential election mainly on his failure to secure the release of the hostages. The operation, one of Delta Force's first, encountered many obstacles and was eventually aborted. Eight helicopters were sent to the first staging area, Desert One, but only five arrived in operational condition. One encountered hydraulic problems, another was caught in a sand storm, and another showed signs of a cracked rotor blade. During the operation's planning it was decided that the mission would be aborted if fewer than six helicopters remained operational, despite only four being absolutely necessary. In a move that is still discussed in military circles, the field commanders advised President Carter to abort the mission, which he did. As the U.S. force prepared to withdraw, one of the helicopters crashed into a transport aircraft which contained both servicemen and jet fuel. The resulting fire destroyed both aircraft and killed eight servicemen. In the context of the Iranian Revolution, Iran's new leader, Ayatollah Ruhollah Khomeini, used the failed operation as a propaganda tool. He claimed that the mission had been stopped by an act of God ("angels of Allah") who foiled the U.S. mission in order to protect Iran and his new conservative theocratic regime. Marines applying identification stripes to a VMFA-323 F-4N aboard Coral Sea. The Joint Task Force commander was Army Major General James B. Vaught, to be forward based at Wadi Kena, Egypt, and reporting directly to the President. Reporting to General Vaught were field commanders USAF Colonel James H. Kyle for aviation, and U.S. Army Delta Force Colonel Charlie Beckwith for ground forces. The Tehran CIA Special Activities Division paramilitary team, led by retired U.S. Army Special Forces officer Richard J. Meadows, had two assignments: to obtain information about the hostages and the embassy grounds, and to transport the rescuers from Desert Two, a site just outside Tehran, to the embassy grounds in pre-staged vehicles. In reality, the most important information came from an embassy cook released by the Iranians. He was discovered on a flight from Tehran at the last minute by another CIA officer, and confirmed that the hostages were centrally located in the embassy compound—this was a key piece of information long sought by the planners. On 31 March, three weeks before the operation, a U.S. Air Force Combat Controller, Major John T. Carney Jr., was flown in a Twin Otter to Desert One, a staging area in the Khorasan Province of Iran, near Tabas (now South Khorasan Province) by covert CIA operatives Jim Rhyne and Claude "Bud" McBroom for a clandestine survey and reconnaissance of the proposed landing strips for the C-130s the ground force would use. 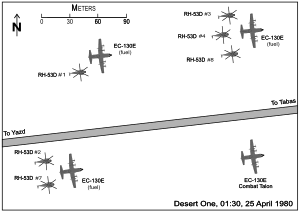 Despite their casual approach to the mission,[clarification needed] Carney successfully surveyed the airstrip, installed remotely operated infrared lights and a strobe to outline a landing pattern for pilots, and took soil samples to determine the load-bearing properties of the desert surface. At that time, the floor was hard-packed sand, but in the ensuing three weeks, an ankle-deep layer of powdery sand was deposited by sandstorms. The "box four and one" pattern acted like a gun sight, with the distant fifth light at the end of the runway lined up in the center of the near four lights positioned at the approach end. The box provided a touchdown area and the far light marked the end of the rollout area. McBroom and Rhyne were awarded the Distinguished Intelligence Cross. Cyrus Vance, the United States Secretary of State, had argued against a push by National Security Advisor Zbigniew Brzezinski for a military solution to the crisis. Vance, struggling with gout, went to Florida on Thursday, 10 April, for a long weekend. On Friday, Brzezinski held a newly scheduled meeting of the National Security Council where President Carter authorized the rescue operation. Deputy Secretary Warren Christopher, who attended the meeting in Vance's place, did not inform Vance. Furious, Vance handed in his resignation on principle, calling Brzezinski "evil". The operation was designed as a complex two-night mission. On the first night, the aircraft would enter Iran in a remote coastal area 60 miles (100 km) west of Chabahar, and fly to Desert One (33°04′23″N 55°53′33″E﻿ / ﻿33.07306°N 55.89250°E﻿ / 33.07306; 55.89250) via the Dasht-e Lut desert. Desert One would be secured and established with a protection force and approximately 6,000 US gallons (22,700 L) of jet fuel would be brought to the area in collapsible fuel bladders carried by United States Air Force (USAF) C-130 aircraft. Three EC-130Es (Call signs: Republic 4 to 6) would carry the logistical supplies and three MC-130E Combat Talons (Call signs: Dragon 1 to 3) would carry the Delta Force and other protection elements . During planning, eight United States Navy (USN) RH-53D Sea Stallion helicopters were positioned aboard the USS Nimitz. The crew of Nimitz were unaware of the reason for the eight helicopters' presence on their ship for months leading up to the rescue attempt; they were told that the helicopters were there to execute a minesweeping mission. The plan called for the helicopters to refuel and fly the Delta Force soldiers 260 miles (420 km) further to Desert Two (35°14′00″N 52°09′00″E﻿ / ﻿35.23333°N 52.15000°E﻿ / 35.23333; 52.15000), located 52 miles (84 km) short of Tehran. Because it would be close to morning, the helicopters and ground forces would hide during the day at Desert Two. The second night would involve the rescue operation. First, CIA agents who were already inside Iran would bring trucks to Desert Two. Together, the CIA agents and ground forces would then drive from Desert Two into Tehran. While the main assault force was moving to Tehran, other US troops would disable electrical power to the area, in an effort to slow any response from the Iranian military. In addition, AC-130 gunships would be deployed over Tehran to provide any necessary supporting fire. Lastly, Army Rangers would capture the nearby Manzariyeh Air Base (34°58′58″N 50°48′20″E﻿ / ﻿34.98278°N 50.80556°E﻿ / 34.98278; 50.80556) so that several C-141 Starlifters could arrive. The ground troops would assault the embassy and eliminate the guards. Afterwards the hostages and troops would rendezvous with the helicopters across the street at the Amjadieh Stadium. Finally, the helicopters would bring everyone to the Manzariyeh Air Base, where the C-141s could fly everyone back to friendly territory. Protection for the operation was to be provided by Carrier Air Wing 8 (CVW-8) operating from Nimitz and CVW-14 operating from the USS Coral Sea. For this operation, the aircraft bore special invasion stripes identification on their right wings. CVW-14 Marine F-4Ns had a red (VMFA-323) or yellow (VMFA-531) stripe enclosed by two black stripes. 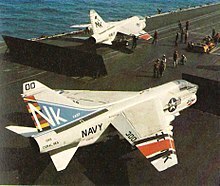 CVW-14 attack aircraft (A-7s and A-6s) had an orange stripe enclosed by two black stripes. Nimitz aircraft were marked in a similar fashion to help differentiate US aircraft from Iranian aircraft purchased from the US (F-14 Tomcats and F-4 Phantoms). Only the delivery of the protection element / rescue team, equipment and fuel by the C-130 aircraft went according to plan. The special operations transports took off from their staging base at Masirah Island, Oman, and flew to Desert One.Dragon 1 landed at 22:45 local time after the hidden lights were activated. The landing was made under blacked-out conditions using the improvised infrared landing light system installed by Carney on the airstrip, visible only through night vision goggles. The heavily loaded Dragon 1 required four passes to determine that there were no obstructions on the airstrip[Note 1] and to align with the runway. The landing resulted in substantial wing damage to the aircraft that later required it be rebuilt from the ground up, but no one was hurt and it remained flyable. Dragon 1 off-loaded Kyle, a USAF Combat Control Team (CCT) commanded by Carney and Beckwith. The ground force consisted of 93 Delta soldiers to assault the embassy, a 13-man special forces assault team from Detachment "A" Berlin Brigade to assault the Ministry of Foreign Affairs, 12 Rangers forming the roadblock team, and 15 Iranian and American Persian-speakers, most of whom would act as truck drivers. The CCT established a parallel landing zone north of the dirt road and set out TACAN beacons to guide in the helicopters. The second and third MC-130s landed using both runways and discharged the remainder of the Delta soldiers, after which Dragon 1 and 2 took off at 23:15 to make room for the EC-130s and the eight RH-53Ds and to return to base to allow the crews to prepare for the second night operations. With only five helicopters remaining to transport the men and equipment to Desert Two, which Beckwith considered was the mission's abort threshold, the various commanders reached a stalemate. Helicopter commander Seiffert refused to use Bluebeard 2 on the mission, while Beckwith refused to reduce his rescue team's size. Beckwith anticipated losing additional helicopters at later stages, especially as they were notorious for failing on cold starts and they were to be shut down for almost 24 hours at Desert Two. Kyle recommended to Vaught that the mission be aborted. The recommendation was passed on by satellite radio up to the President. After two and a half hours on the ground, the abort order was received. Fuel consumption calculations showed that the extra 90 minutes idling on the ground had made fuel critical for one of the EC-130s. When it became clear that only six helicopters would arrive at Desert One, Kyle had authorized the EC-130s to transfer 1,000 US gallons (3,800 L) from the bladders to their own main fuel tanks, but Republic 4 had already expended all of its bladder fuel refueling three of the helicopters and had none to transfer. To make it to the air tanker refueling track without running out of fuel, it had to leave immediately, and was already loaded with part of the Delta team. In addition, RH-53 Bluebeard 4 needed additional fuel, requiring it be moved to the opposite side of the road. To accomplish both actions, Bluebeard 3 had to be moved from directly behind the EC-130. The aircraft could not be moved by ground taxi and had to be moved by hover taxi (flying a short distance at low speed and altitude). [Note 4] A USAF Combat Controller attempted to direct the maneuver from in front of the aircraft, but was blasted by desert sand churned up by the rotor. As the Controller attempted to back away, Bluebeard 3's pilot perceived he was drifting backward (engulfed in a dust cloud, the pilot only had the Controller as a point of reference) and thus attempted to "correct" this situation by applying forward stick in order to maintain the same distance from the rearward moving marshaller. The RH-53 struck the EC-130's vertical stabilizer with its main rotor and crashed into the EC-130's wing root. In the ensuing explosion and fire, eight servicemen died: five of fourteen USAF aircrew in the EC-130, and three of the five USMC aircrew in the RH-53, with only the helicopter's pilot and co-pilot (both badly burned) surviving. [Note 5] During the frantic evacuation to the EC-130s by the helicopter crews, attempts were made to retrieve their classified mission documents and destroy the aircraft. The helicopter crews boarded the EC-130s. Five RH-53 aircraft were left behind mostly intact, some damaged by shrapnel. Bluebeards 2 and 8 now serve with the Islamic Republic of Iran Navy. EC-130E Republic 5 which returned successfully, was retired by the USAF in June 2013 and is now on display at the Carolinas Aviation Museum. The EC-130s carried the remaining forces back to the intermediate airfield at Masirah Island, where two C-141 medical evacuation aircraft from the staging base at Wadi Abu Shihat, Egypt (referred to as Wadi Kena by the US forces due to its location near Qena, 26°33′18″N 33°07′58″E﻿ / ﻿26.555058°N 33.132877°E﻿ / 26.555058; 33.132877), picked up the injured personnel, helicopter crews, Rangers and Delta Force members, and returned to Wadi Kena. The injured were then transported to Ramstein Air Base in Germany. The Tehran CIA team left Iran, unaware of their compromised presence. A replica of the crash site in the Tabas desert using a Fokker F27 fuselage. The White House announced the failed rescue operation at 1:00 a.m. the following day. The embassy hostages were subsequently scattered across Iran to make a second rescue attempt impossible. Iranian Army investigators found nine bodies, eight Americans and one Iranian civilian. The 44 Iranian civilians captured on the bus gave eyewitness accounts of the operation. Eight US service members died during the mission. A memorial honoring them is located in the Arlington National Cemetery. On 25 April 1980, Major General Robert M. Bond read President Jimmy Carter's eulogy at a memorial service to them. Retired Chief of Naval Operations Admiral James L. Holloway III led the official investigation in 1980 into the causes of the operation's failure on behalf of the Joint Chiefs of Staff. The Holloway Report primarily cited deficiencies in mission planning, command and control, and inter-service operability, and provided a catalyst to reorganize the Department of Defense, and the Goldwater–Nichols Act of 1986. The lack of well-trained Army helicopter pilots who were capable of the low-level night flying needed for modern special operations missions prompted the creation of the 160th Special Operations Aviation Regiment (SOAR) (Night Stalkers). In addition to the 160th SOAR's creation, the US Defense Department now trains many military helicopter pilots in low-level penetration, aerial refueling and use of night-vision goggles. MH-47, CH-53E, MH-60 and MV-22 aircraft all include special operations capabilities. Planning for a second rescue mission was authorized under the name Project Honey Badger shortly after the first failed. Plans and exercises were conducted, but the manpower and aircraft requirements grew to involve nearly a battalion of troops, more than fifty aircraft, and such contingencies as transporting a 12-ton bulldozer to rapidly clear a blocked runway. Even though numerous rehearsal exercises were successful, the helicopters' failure during the first attempt resulted in development of a subsequent concept involving only fixed-wing STOL aircraft capable of flying from the US to Iran using aerial refueling, then returning to land on an aircraft carrier for medical treatment of wounded. Despite Credible Sport's failure, the Honey Badger exercises continued until after the 1980 US presidential election, when they became superfluous. Even so, numerous special operations applications and techniques were developed which became part of the emerging USSOCOM repertoire. President Carter continued to attempt to secure the hostages' release before his presidency's end. On 20 January 1981, minutes after Carter's term ended, the 52 US captives held in Iran were released, ending the 444-day Iran hostage crisis. US Secretary of State Cyrus R. Vance, believing that the operation would not work and would only endanger the lives of the hostages, opted to resign, regardless of whether the mission was successful or not. His resignation was confirmed several days later. Who crushed Mr. Carter's helicopters? We did? The sands did! They were God's agents. Wind is God's agent ... These sands are agents of God. They can try again! Various reasons for the mission failure have been argued, with most analysts agreeing that poor planning, flawed command structure, lack of adequate pilot training and poor weather conditions were all contributing factors and combined to doom the operation. The incident is considered to be a blow to US prestige, occurring after the Vietnam War. The incident is considered as a US defeat and is commemorated annually in Tabas where government officials, religious and people gather and display wreckage of the American planes and helicopters from the incident. A mosque was built at the crash site. In April 2014 Iran's parliament claimed it was preparing a bill to oblige the government to estimate the damage the country suffered from the operation. The decision was introduced a few days after the US seized Iran's assets in Manhattan which included a skyscraper that lodged the headquarters of the Iranian Alavi Foundation. Wikimedia Commons has media related to Operation Eagle Claw. ^ This was done by use of a Forward looking infrared (FLIR) pass before attempting to land. ^ It was originally planned to simulate a head-on accident between the tanker and the bus, flying the bus passengers out of Iran aboard Dragon 3 and then returning them to Manzaniyeh on the second night. ^ Either because of a deflated nose gear tire, because of the layer of soft sand, or both. It had originally been positioned behind the EC-130 by a flight technique in which its nose gear was held off the ground while it rolled on its main gear. ^ The 5 US Airmen killed were Major Richard L. Bakke, Navigator; Major Harold L Lewis Jr., Pilot & Aircraft Commander; TSgt Joel C. Mayo, Flight Engineer; Major Lyn D. McIntosh, Co-Pilot; and Captain Charles T. McMillan, Navigator. The 3 US Marine fatalities were Sgt John D. Harvey, Cpl George N. Holmes Jr., and SSgt Dewey L Johnson, the 3 of them were Marine Helicopter crewmen & riflemen. USMC Majors Jim Schaefer, pilot, and Les Petty, co-pilot, were casualties. ^ For example, the Army has its own special operations command, which controls its special operations forces. The USAF special operations units that supplied the rescue attempt's MC-130 elements were awarded the Air Force Outstanding Unit Award for both that year and the next, had the initial squadron of nine HH-53 Pave Low helicopters transferred from Military Airlift Command to its jurisdiction for long-range low-level night flying operations, and became co-hosts at its home base of Hurlburt Field with Air Force Special Operations Command. ^ a b Gabriel (1985), pp. 106–116. ^ a b c Bowden, Mark. "The Desert One Debacle". The Atlantic. Retrieved 20 September 2013. ^ "Operation Eagle Claw, 1980: A Case Study In Crisis Management and Military Planning". ^ Waugh, Jr, William L. "The Structure of Decision-Making in the Iranian Hostage Rescue Attempt and its Implications for Conflict Management". The Centre for Digital Scholarship Journals. ^ Guerrier, Steven W.; Hastedt, Glenn P. (2010). Spies, Wiretaps, and Secret Operations [2 volumes]: An Encyclopedia of American Espionage. ABC-CLIO. ISBN 978-1851098071. ^ Hoe, Alan (2013). The Quiet Professional: Major Richard J. Meadows of the U.S. Army Special Forces. University Press of Kentucky. p. 237. ISBN 978-0813144511. ^ a b Bottoms, Mike (2007). Carney receives Simons Award (pdf). Tip of the Spear. United States Special Operations Command Public Affairs Office. pp. 26–31. Retrieved 11 November 2010. ^ Pushies, Fred (2009). Deadly Blue: Battle Stories of the U.S. Air Force Special Operations Command. AMACOM. p. 15. ISBN 978-0814413609. ^ a b c d e Douglas Brinkley (29 December 2002). "The Lives They Lived; Out of the Loop". The New York Times Magazine. Retrieved 3 May 2017. ^ a b Buck, Peter (2015). The Iranian Hostage Rescue Attempt: A Case Study. ISBN 978-1782899686. Retrieved 5 April 2017. ^ a b Lambert, Laura. "Operation Eagle Claw". britannica. ^ Thigpen, Jerry L.; Hobson, James L. (2011). The Praetorian STARShip: The Untold Story of the Combat Talon. Air University Press. p. 210. ISBN 978-1780391977. ^ a b Kamps, Charles Tustin. "Operation Eagle Claw: The Iran Hostage Rescue Mission". www.au.af.mil. Retrieved 9 April 2018. ^ Caraccilo, Dominic (2015). Forging a Special Operations Force: The US Army Rangers. Helion and Company. ISBN 978-1912174416. Retrieved 9 April 2018. ^ Bowden, Mark. "The Desert One Debacle". The Atlantic. Retrieved 9 April 2018. ^ Radvanyi, Richard, A. Maj. "Operation Eagle Claw: Lessons Learned". USMC Command and Staff College. Retrieved 20 September 2013. ^ Dougherty, Kevin (2013). Military Decision-Making Processes: Case Studies Involving the Preparation, Commitment, Application and Withdrawal of Force. McFarland. ISBN 978-0786477982. ^ "EC-130E 62-1857". Carolinas Aviation Museum. Retrieved 1 October 2018. ^ Bowden, Mark. "The Desert One Debacle". The Atlantic. Retrieved 29 December 2016. ^ Hawk, Kathleen Dupes; Villella, Ron; Varona, Adolfo Leyva de (30 July 2014). Florida and the Mariel Boatlift of 1980: The First Twenty Days. University of Alabama Press. p. 67. ISBN 978-0817318376. Retrieved 11 October 2014. ^ Carter, Jimmy (1 January 1981). Public Papers of the Presidents of the United States: Jimmy Carter. Best Books on. p. 780. ISBN 978-1623767761. Retrieved 11 October 2014. ^ a b Holloway, James L. Adm. "The Holloway Report" (PDF). Accessed 31 March 2007. ^ Crowley, Michael (4 November 2013). "The Incredible, Absurd Iranian Hostage Rescue Mission That Never Happened". Time. Retrieved 10 April 2018. ^ James Bancroft. "The Hostage Rescue Attempt In Iran, 24–25 April 1980". Retrieved 11 November 2010. ^ "Iran Hostage Crisis ends – History.com This Day in History – January 20, 1981". History.com. Retrieved 8 June 2010. ^ "Cyrus R. Vance". 22 December 2016. ^ "The failure of the US Army in Tabas". Imam Khomeini. 25 April 1980. Retrieved 31 May 2015. ^ Ward, Steven R. (2014). Immortal, Updated Edition: A History of Iran and Its Armed Forces. Georgetown University Press. p. 237. ISBN 1626160325. ^ Amini, Hossein. "Operation Eagle Claw: God foiled the plot". english.khamenei.ir. Retrieved 4 January 2016. ^ "Imam Khomeini: "Sands were God's agent in Tabas."". Kayhan. Retrieved 10 April 2018. ^ "فيلم توفان شن". 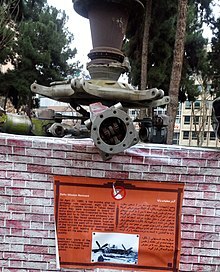 Iranian Movie DataBase (in Persian). 2015. Retrieved 31 May 2015. ^ "Ham Avaz-e Toofan". Hamed Zamani Music. 2015. Archived from the original on 27 March 2015. Retrieved 31 May 2015. ^ Celmer, Marc A. (1 January 1987). "Terrorism, U.S. Strategy, and Reagan Policies". Greenwood Publishing Group – via Google Books. ^ Operation Eagle Claw blow US prestige. Retrieved 14 April 2018. ^ "Iran marks US defeat anniversary in Tabas desert". Islamic Republic News Agency. Retrieved 11 April 2018. ^ "Iran marks failed US military operation anniv". en.alalam.ir. 25 April 2013. Retrieved 11 April 2018. ^ "God and the captain of revolution in the Tabas desert". Comprehensive center of contemporary Iranian history. Political Studies and Research Institute. Retrieved 11 April 2018. ^ Staff Sgt. Katherine Holt (24 April 2015). "Sacrifices made during Operation Eagle Claw remembered 35 years later". Retrieved 30 September 2015. ^ a b c d Warnock, A. Timothy (2000). Short of War: Major USAF Contingency Operations, 1947–1997 (PDF). Retrieved 30 September 2015. ^ Col John T. Carney Jr.; Benjamin F. Schemmer (2003). No Room for Error: The Covert Operations of America's Special Tactics Units from Iran To Afghanistan. Presidio Press. ISBN 978-0345453358. ^ Stew Smith. "Delta Force: Missions and History". military.com. Retrieved 30 September 2015. ^ Jack Murphy. "Detachment A: Clandestine Special Forces Missions from Berlin to Iran". detachment-a.org. Retrieved 8 August 2018. ^ "75th Ranger Regiment". goarmy.com. Retrieved 30 September 2015. Higham, Robin; Parillo, Mark (2013). The Influence of Airpower upon History: Statesmanship, Diplomacy, and Foreign Policy since 1903. p. 227. ISBN 0813140722. Retrieved 5 April 2017. ^ "EC-130E 62-1857". Carolinas Aviation Museum. Retrieved 1 August 2017. ^ "Iran to claim damage on Operation Eagle Claw". Young Journalists Club. 21 April 2014. Retrieved 31 May 2015. Bottoms, Mike (2007). "Carney receives Simons Award" (pdf). Tip of the Spear. United States Special Operations Command Public Affairs Office. pp. 26–31. Retrieved 11 November 2010. Kamps, Charles Tustin (2006). "Operation Eagle Claw: The Iran Hostage Rescue Mission". Air & Space Power Journal. Department of Transportation, US Government (2012). Aeronautical Information Manual (PDF). U.S. Department of Transportation: Federal Aviation Administration. pp. 4–3–18. Archived from the original (PDF) on 5 March 2013. Thigpen (2001). The Praetorian STARShip : the untold story of the Combat Talon. DIANE Publishing. ISBN 9781428990432.